There are no absolute rules for how long individual documents should be retained. However, retention can be divided into different holding periods and different types of documents can be assigned to those periods to help make record retention more manageable. The length of time you should keep a document depends in part on the transaction and on the importance of the document to understanding the entity’s formation and history. Indefinite Retention. Documents relating to an Organization’s founding should be retained until seven years after the entity’s dissolution. That includes the Articles of Incorporation along with Original and Amended Bylaws. Board Minutes, Annual tax returns, and Annual Financial Statements are also an integral part of the entity’s history. In the case of Non-Profit Organizations, these documents, together with the federal and state Applications for Non-Profit Exemption (Federal Form 1023), are public documents and copies must be provided to anyone who requests them. Because questions about length of employment can sometimes arise years after termination, payroll tax returns (or, at a minimum, annual W-2s) should be kept indefinitely. Data supporting the cost of homes and other investments need to be retained until the property or stock is sold and the period after the tax reporting is closed. Seven-year Statute of Limitations. Generally, you must keep documents that support an item of income or deductions ... whether on an individual, trust, partnership, or corporate tax return ... until the end of the period during which you can amend your tax return to claim a credit or refund, or in which the taxing authority can assess additional tax. Tax returns can only be amended: (1) three years back from the date the return is filed in the case of federal returns, and (2) four years back in the case of state returns. However, Federal and State authorities can go back seven years if they believe that returns have been fraudulently prepared or deliberately misstated. Failure to report offshore earnings allows the taxing authorities to review returns back seven years. Sales tax audits frequently go back four years and can require access to invoices for the full four year period. 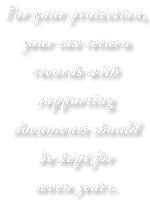 Accordingly, we advise our clients to keep copies of their tax returns and supporting documents for seven years. The IRS provides additional information at: http://www.irs.gov/business. The California Franchise Tax Board has additional information at: https://www.ftb.ca.gov/businesses/keeping_records.shtml.